DO-39758-99 was succesfully added to your cart. Temperature indicator features selectable temperature scale (°F/°C), high/low set points, min/max reading, data hold, alarm icons, and low-battery indicator.Digital thermometers are inexpensive, easy-to-use instruments that display temperature in a fast-responding digital format. Digital thermometers come in pocket-sized, remote, wall, panel-mount and even tabletop versions. They typically have a stainless steel probe sheath with thermistor or diode sensor. Probes can have varying lengths and are even equipped with extension cables for difficult to access temperature measurement. Wireless thermometers are also available for remote digital temperature monitoring. NSF-approved thermometers are waterproof to allow complete sanitization and some even add antimicrobial protection. Pocket thermometers usually require a battery but are available solar-powered for temperature monitoring over an extended period of time. Dual-channel indicators can provide indoor/outdoor comparisons while min/max thermometers give a digital readout of highest and lowest temperatures read. 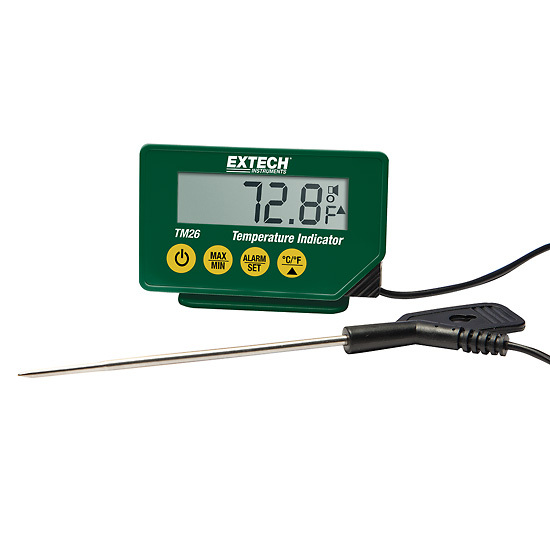 Davis Instruments features general purpose digital thermometers from trusted brands including Extech, Taylor, Cole-Parmer, Oakton, Testo, and Comark. For more information about digital thermometers contact a Davis Application Specialist today. probe, magnetic back, foot stand, and one CR2032, 3 V battery.